When planning your kitchen, a larder unit can be a very convenient unit to factor into your design. But, there are many different styles of larder unit and each of them has their own unique benefits. 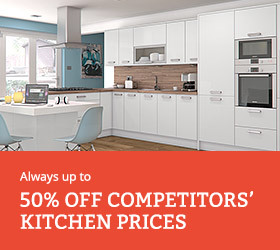 So, you may want to spend some time reading this article, to ensure that you get the perfect larder for your new kitchen. 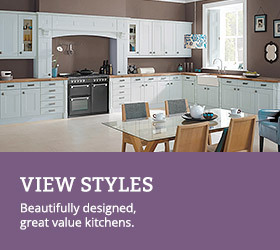 If you ever visit our kitchen showroom then all these units are on display in the Information Centre. These pull out larder units units come with 5 adjustable sizable shelves that can be easily removed from the wirework by lifting up and then pulling out. This allows you to space the shelves out to accommodate the items that you are going to put in there. If you find that you need a little more space in there for taller items then simply just removed one of the wire shelves. The whole pull out larder unit and door comes out towards you, and then you can access the items inside from each side of the unit. This unit would be ideal in a spacious kitchen where no clashing or blocking of access to the kitchen will occur. The width available for additional baskets is 300mm wide. But additional baskets for 400mm, 500mm and 600mm wide versions aren’t available unfortunately. There are also options available to have split doors on these units at different heights, if that is something that you would require. The swing out pantry unit is fantastic! These units have 6 shelves in the door (not adjustable) but each shelf allows for items with a maximum height of 29cm to be placed into them. Inside the unit there are also 6 shelves, which are adjustable. Because of the way that this unit opens, big objects may be a little harder to put on one of the higher shelf as the pulling mechanism for bringing the shelves out towards you, runs through it. 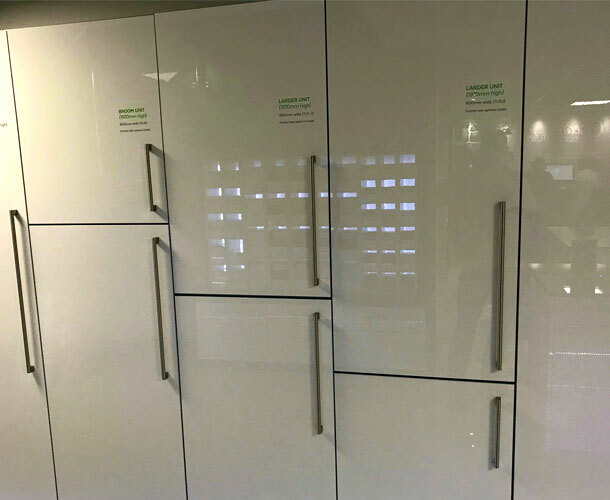 This unit has a door which opens like the rest of the units in your kitchen and this unit is ideal if you have lots of items like bottles, jars and packets that you need to store away. The swing out larder unit is a delight to have in any kitchen. It has 5 large adjustable shelves that move towards you as the door is opened, bringing the items to you rather than having to reach to the back of the unit. The unit in this example also has some lighting inside it, which is activated when the door is opened. 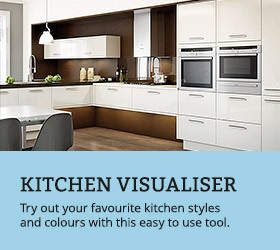 This is ideal for such a big unit and illuminates the contents of it, to make it easier to find what you are look for. The internal drawer larder unit is a slightly different type of larder unit, as there are no wireworks, just 4 big pull out drawers that can hold vast amounts of items. 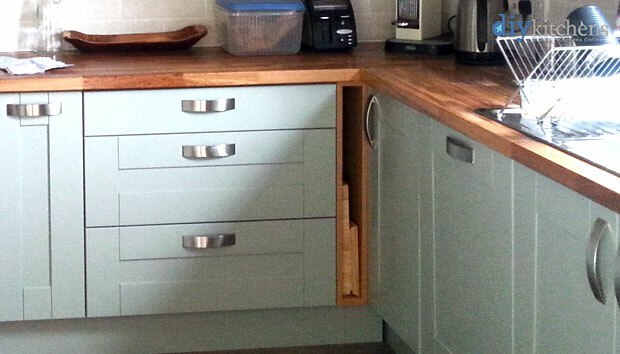 There is also some free cupboard space above, like you would find in a normal 560mm deep kitchen unit. 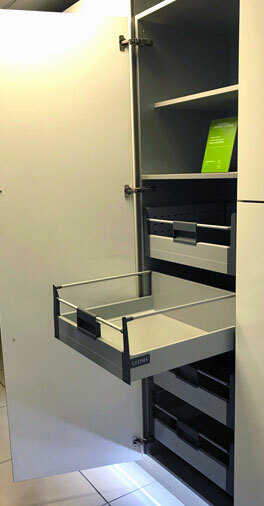 There is also a similar internal drawer larder unit, which is 1000mm wide, but it only has the 2 drawers in the unit, located at the bottom, which give some incredible storage space for many saucepans, slow cookers and any other bulky appliances that you want to hide out of the way, until they are required again. Any finally, there are tall larder/broom units, which have split doors (various combinations) to give you 2 areas within the unit to store items, using shelving like you would get in a base unit. 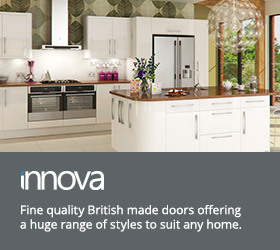 You can also get these units with just the one door if required. The tall larder units with 1 door are ideal for storing tall items, such as ironing boards, brushes and mops. 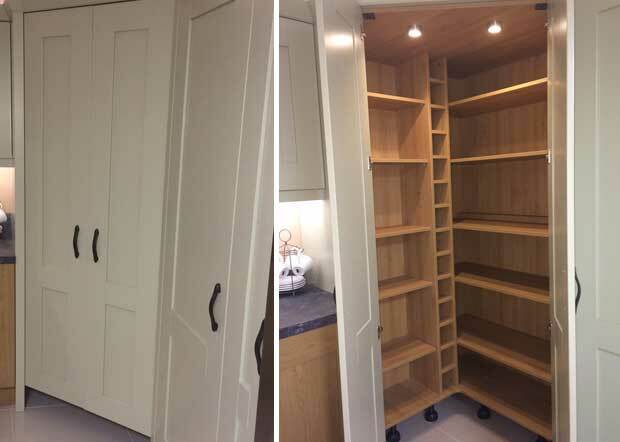 There are also larder units available with double doors that open outwards, and these double larder units come in widths of 800mm & 1000mm wide. Walk in larder units are very different from the larder units above, they fit into a corner and you actually get to climb inside these ones! See the image below. The walk in larder offers a vast amount of storage with 12 shelf storage compartments as well as space for 14 bottles in the bottle rack. We only have the one walk in larder unit available and it comes with 3 different door combinations, as shown below. 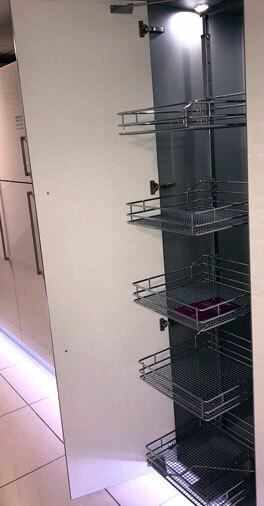 The larder units with multiple vertical doors, are joined together to allow the larder unit to match the lines of the other base or wall units. So there you have it, 6 larder/pantry units. Which one would you choose? All these larder units and pull out larder units are available on our website. Do you make curved units? I’m planning a new kitchen and space is tight. Do you have a cabinet that could house a washer and a dryer stacked on top of each other? I’m talking about stand alone appliances rather than built in. Failing that, do you do a cabinet that would allow for a built in washer and dryer to be stacked? We also have a stand alone Miele fridge that is H201cm x W60cm x D63cm. Do you have anything that could house this, something that doesn’t have a door would be fine. Or maybe advise what parts I’d need to box it in? Can you also advise on the benefits and drawbacks of painted gloss doors vs vinyl wrapped? We do not have any units to house any washers/dryers on top of each other, as stacking appliances like this is not overly safe. We don’t have any units to house standalone appliances either, as the depth of these appliances are far deeper than that of our units. If you wanted to build something, you would have to create something out of end panels and secure these to the walls. With regards to painted gloss doors and vinyl wrapped ones. This page talks about the construction of them. Both doors are of good quality and hard wearing but the Vinyl wrap is a foil coating used on our Malton MDF door only, to give it the effect of real wood. What type of plinths do you have to buy for the Altino Light Grey Walk in larder? Do you have to order gloss door material plinth for the outside doors, and additional carcass material plinth for inside the walk in larder to cover the legs? Also, if you do have to use carcass material plinth for the inside of the walk in larder, do you have to use curved carcass material plinth, as I notice on the photo above the internal corner of the walk in larder has a curve? 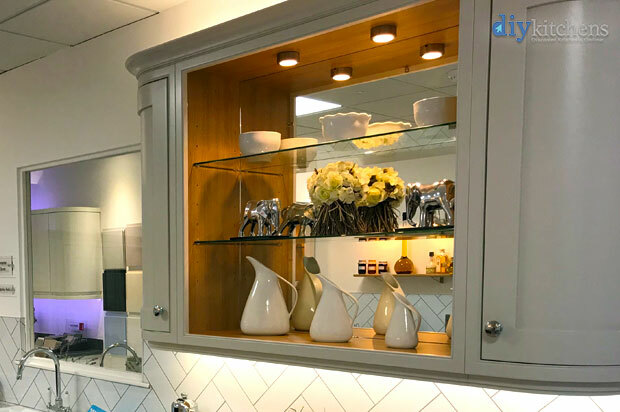 Hi Matthew, the walk-in larder only requires one set of plinth, which attaches to the bottom of the doors with a pair of Z brackets, which are supplied with the unit. You will also need to purchase door material plinth, to cover this and this should be taken out of the total calculation of your overall plinth requirement. If you did not want the legs of the unit to show, once the unit doors were opened, then some plinth in unit material can be used to cover them. 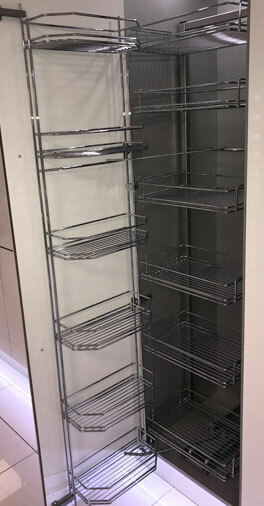 Hi, Is it possible to buy additional baskets for 300mm wide pull out larder units? Hi Keiko, Yes we are able to supply the 300mm baskets for the pull out units. They are £25.00+ vat per basket and can be ordered through the sales team. Hi – can these additional baskets be added after installation? How many come as standards? 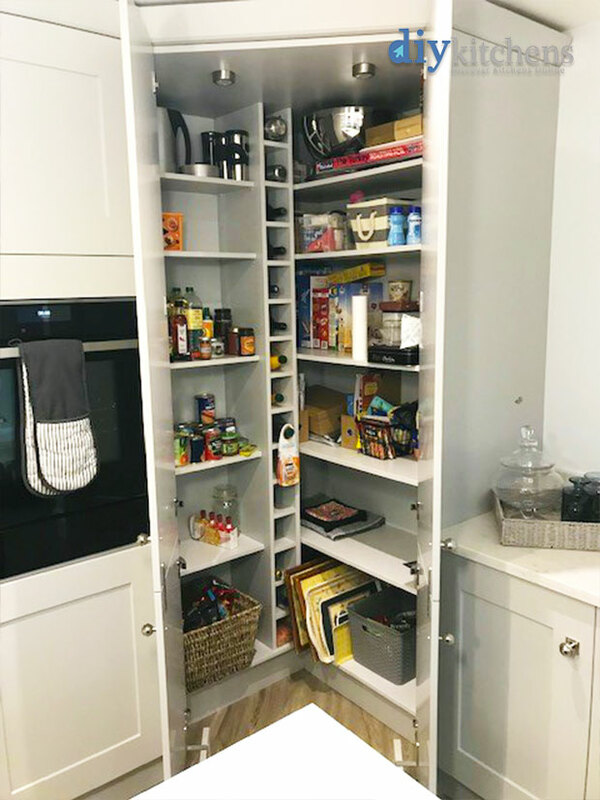 Hi Fiona, the swing out pantry comes with 6 shelves in the door (not adjustable) but each shelf allows for items with a maximum height of 29cm to be placed into them. Inside the unit there are also 6 shelves, which are adjustable. The larder unit comes with 5 adjustable shelves that can be easily removed from the wirework by lifting up and then pulling out. The width available for additional baskets is 300mm wide. They are £25.00+ VAT per basket and can be ordered through the sales team. But additional baskets for 400mm, 500mm and 600mm wide versions aren’t available unfortunately. Can a ironing board fit inside a broom cupboard? H James, all the broom units come with a fixed shelf, unfortunately an ironing board is too big to fit in the unit with the shelf being in the place it is positioned, but you can order the unit dry assembled, so that you can fix the shelf in the place you require. Regarding the internal drawer larder unit, are these drawers the same style/construction as the pan drawers in your base units? Are there other options for the drawers? I was looking for a Blum Legrabox space tower and this is the closest I’ve found on your website. Thank you. Hi Caroline, the internal pan drawers are the same drawer boxes for which we use on our standard pan drawer units, although these will have a fixed front on there. These are the only options that we have available. Can you tell me if the larder unit LU10 is the same as the broom unit BU10 but with shelves?, are the shelves removable/adjustable please? Hi Tony, the broom and larder units are similar. The larder unit has 1 fixed shelf and five removable shelves. The broom unit just has the one fixed shelf. Is it possible to add a single pull out shelf to a tall larder/broom unit in an inframe kitchen? I’m wanting to store my toaster inside a tall cupboard and pull it out on a shelf to use with power inside the cupboard. Hi Suzy, unfortunately, we do not supply the pull out shelf in the inframe ranges, as the mechanism would catch on the frame as it was opened. What about for a design such as Luca? Hi David, tall larders also work well in the Luca range, as the handles on tall doors are built into the side of the door, from top to bottom. I hope this answers your question.